It is with great sadness that we have to let you know that Storm was put to sleep on 21st August 2017. Sadly Storm had been suffering with arthritis which had deteriorated so the kindest thing to do was to put him to sleep. 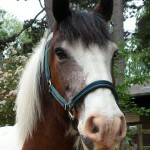 Storm was a much loved pony and will be very sadly missed. It is with great sadness that we have to inform you that JJ was put to sleep on 7th March 2017. JJ had been at the Centre since February 2006 and was very much loved by everyone. He will be sadly missed. It is with great sadness that we have to inform you that Bonny, our lovely Norwegian Fjord was been put to sleep in June 2016. She had not been well, and the vet was called. Sadly the prognosis was not good, so the kindest thing to do was to put her to sleep. 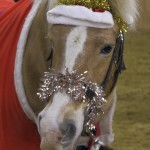 Bonny was a much loved pony and will be missed by everyone at the Centre. Sycamore Atypical Myopathy was most unexpected. Chunky was a most loved pony – an exceptional herd leader, a steady ride for some of our most disabled and nervous riders and a calm and intelligent pony in an uncertain situation. We will miss him dreadfully. We are very sad to say that after many years of loyal service to the Centre, our much loved pony, Sunny, was put to sleep in February 2014. Unfortunately, his health had deteriorated and the prognosis wasn’t good. After much discussion between the vets, the Riding Committee and the Management Committee it was agreed that it would be kindest to put him to sleep before his condition deteriorated further. 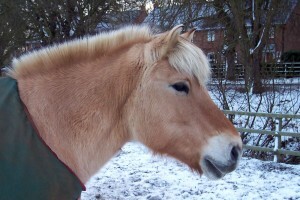 Sunny was a very popular pony and played a full part in the Centre’s activities. He was endlessly patient and unflappable. He was much loved by volunteers and riders alike and will be greatly missed. Greg and Sue Warwick took part in the 2013 Screwball Rally on 25th September for 5 days, driving through France and Northern Spain and back. 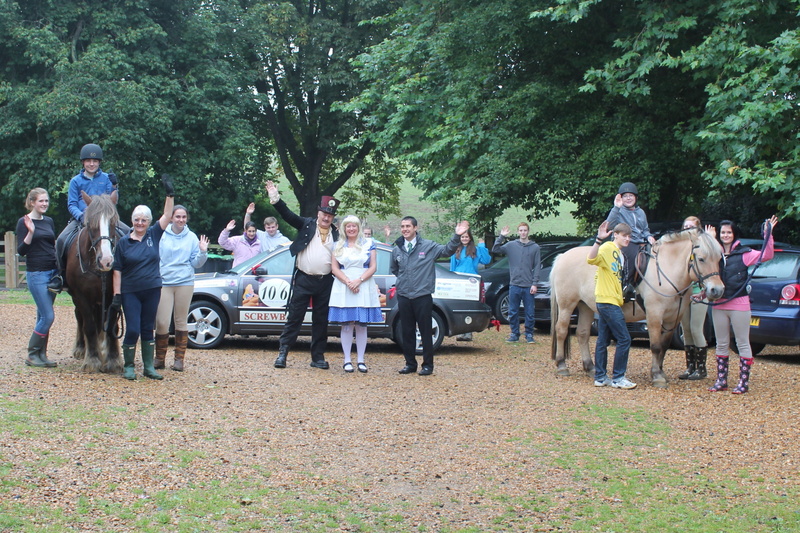 Their car was generously provided by Terence Byrne, director of Progress Skoda in Elms Farm, Bedford. This trip was totally funded by Greg and Sue so every penny donated went straight to the Centre. Congratulations to Leigh McInnes, one of the Tuesday evening riders, and Tom, who came first in Countryside Challenge and Dressage at the RDA National Championships in Hartpury. Congratulations also to Emily Walker who came second with her lovely painting of herself, Tom and the team of helpers at Oaklands 2012. Rosemary joined the Elisabeth Curtis Centre in 1989 and she was just the kind of volunteer we love. She was already a highly qualified teacher and horse owner, and soon went on to become a qualified RDA Group Instructor (1993). She worked with riders from Grange School and Bromham Hospital, before moving to the Thursday morning session. She also took over a group in Cambridgeshire for over a year until they managed to find someone to replace her. 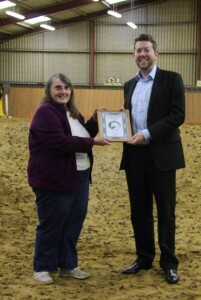 Rosemary worked towards her RDA Instructor qualification but due to a mix-up over exam dates, did not take the final exam. Rosemary was a member of the Riding Committee and Management Committee. She was Chairman for about four years around the time of the second visit of HRH the Princess Royal, in 1998. She continued to volunteer whenever she felt well enough and would still pop in for coffee even if she didn’t feel strong enough to work with the riders and ponies. She loved her time at the Centre and always did all she could to help it to flourish. Sadly, Rosemary died at St John’s, Moggerhanger on 19th June 2013. She will be greatly missed. It is with deep regret that we have to announce the death of Sharon Thompson, Instructor, after a brave fight against cancer. She will be greatly missed by riders and helpers, both past and present, on the Tuesday evening session. Our thoughts are with her family. Elisabeth Curtis Centre by running the London Marathon. Matthew is pictured here with Jan, our Chairman, being presented with a certificate to thank him for his fundraising. If you are looking for any of the older articles from our news page, please use the above link.